This is part four of six essays documenting what we have learned about building new networks for local news and fostering more creative, sustainable and community driven journalism. Read part one, part two and part three. A key part of the model we have been pursuing in New Jersey for the past five years is the idea that local news will be stronger working together than it is working in isolation. To that end, we continue to test strategies to help create a more connected, collaborative and inclusive media ecosystem where all the participants have avenues to work together and share resources. This means building new kinds of networks and strengthening old networks to foster collaboration, sustainability and engagement. Cohort of Local Newsrooms — At its most basic, the cohort of newsrooms that are part of the Local News Lab are a network in and of themselves. They regularly share what they are learning, advise each other, and look for ways to collaborate. We’ve seen a few examples of sites replicating each other’s revenue strategies and engagement efforts. Our hope is that this kind of sharing and peer-to-peer learning experiences can spread to other organizations in the state. However, while there is an incredible generosity amongst sites across the state, this kind of sharing doesn’t happen automatically. It benefits from some facilitation, structure and creating opportunities for sharing. The Center for Cooperative Media — The Center for Cooperative Media and its NJ News Commons serves as a central hub for training and collaboration across the state. Over the past several years, we have seen membership in the NJ News Commons grow and they have served as important trust builders, service providers and event hosts. Particularly in the past year, they have also become important disseminators for the lessons we are learning with the partner sites. We’ve held a number of trainings with the Center including analytics, podcasts, events, ad sales and more. The Center also hosted a national conference on community engagement, “Engage Local” which included many of our sites and partners. The Center has become an “enabling structure,” helping coordinate and support other networks and collaborations. New America Media — New America Media is the nation’s largest network of ethnic and foreign language media. They are working with us and the Center for Cooperative Media to help connect the ecosystem and build relationships with foreign language media sources in New Jersey. We believe that ethnic media outlets have lessons to teach other journalists in the state about engagement and service to community, and we think that new digital media outlets could share expertise with online tools and strategies with ethnic media outlets. There are other collaborative reporting possibilities that we are excited to explore as well, but all of that must be built on a strong foundation of trust. To that end, New America Media is holding in-person meetings and gatherings across the state. Center for Investigative Reporting — The Center for Investigative Reporting (CIR) is leading a large-scale collaborative investigative reporting project in New Jersey. The “Dirty Little Secrets” series is investigating New Jersey’s toxic legacy with New Jersey Public Radio/WNYC, WHYY, NJTV, NJ Spotlight, Jersey Shore Hurricane News, WBGO, New Brunswick Today and the Rutgers Department of Journalism and Media Studies. The project is coordinated by The Center for Investigative Reporting with help from the Center for Cooperative Media at Montclair State. CIR will also be collaborating with other arts and environmental organizations across the state. As with the cohort of five sites, this large-scale collaboration benefits immensely from facilitation which is provided by both CIR and the Center for Cooperative Media / NJ News Commons. We have learned a lot about building journalism networks at the local level. And we have grappled with some very real challenges. Different kinds of networks and collaborations will serve different kinds of sites. In its first few years the Center for Cooperative Media and NJ News Commons has emphasized serving small local newsrooms and has not provided as much value for larger newsrooms. However, the CIR and Hearken collaborations are engaging larger newsrooms in meaningful ways. Our ecosystem approach in New Jersey is rooted in the idea that as local news changes in shape and capacity, it needs new kinds of support. Therefore, we are also testing whether we can create shared services for the whole ecosystem that have historically only been easily accessible and built into well-established newsrooms. We know that shared services at professional organizations can work. Places like the Institute for Nonprofit News and the Association for Alternative Newsmedia have created important offerings — like pooled insurance, technology support and ad networks — that serve their entire membership of small news organizations at scale. We don’t yet know if that can be duplicated in a geography like New Jersey. In year one, we tested two of these shared services: technology and legal. We hope to test 1–2 other shared services, like marketing and events. Tech — Local news sites reported that they wanted more access to web development and tech support, so we found a local firm that could give sites unlimited access to basic tech support for a small monthly fee. We realized pretty quickly that this was an idea that looked good on paper, but in practice it didn’t meet the real-life needs of our local news sites. Accordingly, we adjusted our strategy and began exploring other ways of getting small newsrooms access to tech and design resources. You can read what we learned from that experience here. Legal — We are working with Ellen Goodman at Rutgers Law to create an online, growing list of legal questions and answers for journalists in New Jersey. 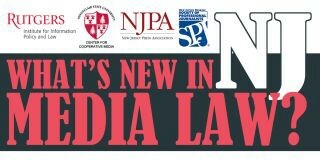 Prof. Goodman is holding a summit on NJ legal issues for journalists in the state later this spring. However, local journalists need more than a reference guide to legal issues. They also need direct support. To respond to this need, we are working to create a network of pro-bono or low-cost media lawyers to support local sites. Throughout our efforts over the past five years we have invested in informal information gathering and formal research to help us chart the landscape of news in New Jersey. Getting a lay of the land has been important for guiding our grantmaking and giving us a sense for what communities need and want. In the last year, we’ve specifically constructed this research in ways that are meant to directly serve local news organizations by gathering critical community information and user feedback that they couldn’t otherwise invest in. Focus Groups — Prof. Napoli and his team also conducted six focus groups (two in each city: Newark, New Brunswick, Morristown) to better understand people’s news habits and what they wanted and needed from local news. We then used that feedback to design revenue strategies with the local newsrooms. Prof. Napoli and his team are writing up their process for these focus groups to create a guide for other newsrooms who want to conduct similar efforts in their community. Best Practices in New Revenue Models — CUNY’s Graduate School of Journalism worked with a series of researchers to study best practices in membership models, print and digital revenue, and more. They produced a legal guide for news entrepreneurs and hosted a day-long event on new membership models for news. We supported aspects of this work with staff time. This is part four of six essays documenting what we have learned about building new networks for local news and fostering more creative, sustainable and community driven journalism. In the next essay we’ll discuss innovations in philanthropy that can help support a brighter future for local news.